Monster bummed after watching X2: X-Men United. Why? Becuz next to eat cookies, nothing me like better dan to complain. 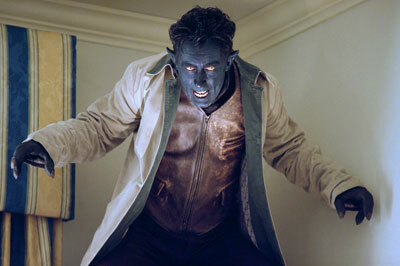 But X2: X-Men United not give monster much to complain about. It an even better movie dan original X-Men movie. For true! Movie kick off wit awesum aktion sekwence in which furry blue mutant (not to be confused wit furry blue muppet) use teleport power to ALMOST kill President. 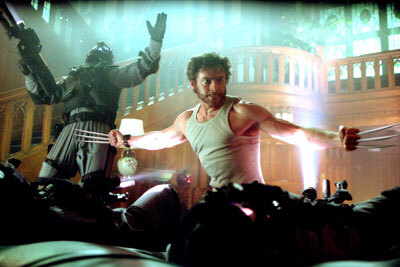 Dis attack give bad guy Colonel William Stryker excuse to move against Xavier’s School for Mutant. BUT Wolverine happen to be at de school and he be VERY cranky. So cranky, in fakt, dat he go all shish kebab on Stryker’s strike team. Most kids escape. Meanwhile, Professor X and Cyclops captured! Wolverine, Iceman, Rogue, and FireBoyLad escape and hideout at home of Bobby Drake (Iceman). Bobby’s family come home and Bobby come out to dem. Everyone very understanding, except mutaphobic little brother who call cops. Wolverine shot in head and dis make FireBoyLad very angry. He torch some cop cars (didn’t Stanley Cup riot in Vancouver teach him anyting?) and dey eskape again – wit Wolverine who bounce back pretty well from head shot. Meanwhile, Magneto eskape prison wit help of Mystique – and prison guard’s high iron content. No doubt, guard deeply regret decision to go wit spinach salad lunch! Magneto and Mystique team up wit Wolverine, Rogue, Iceman, FireBoyLad, Jean Grey, Storm, and furry-blue-almost-president-killer Nightcrawler (who was mind-control viktim after all) to stop Stryker. Dey track him down to old dam facility. Dis always de way. For once, monster want to see supervillain set up HQ in nice Viktorian brownstone or food truck speshulizing in Korean fusion quizine. Everybody suspekt abandoned missile silo but nobody suspekt Bill’s Bulgogi Buggy. Anyway, X-Men infiltrate facility while Stryker use his own mutant son to control Professor X to control Cerebro to locate all mutants and kill dem! Jean fights Cyclops and smack some sense into him. Wolverine face off against Lady Deathstrike who have adamantium clawz, just like him. Dey fight and he kill her but monster feel very sorry for Lady Deathstrike becuz she under Stryker’s control and not herself. Me imagine dat when not under mind control, Lady Deathstrike very pleasant gal who like to laugh, romantik walks on de beach, and perforating eyeballs. 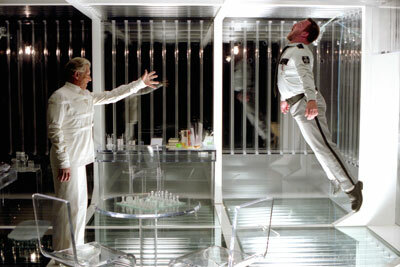 Magneto turn tables on Stryker AND Professor X, controlling him to control Cerebro to locate all humans and kill dem! Magneto and Mystique eskape in helicopter – along wit FireBoyLad who join up becuz dey promise to help him come up wit cool nickname (monster’s suggestions inklude: Flamer de Flaming Man, Burny, and Hot Pantz). Wit Nightcrawler’s help, Storm reach Professor X in nick of time and stop him from wiping out humanity. 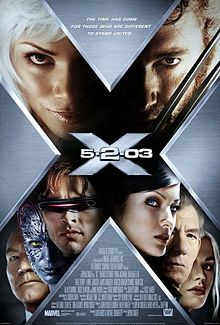 Monster like original X-Men movie a lot and dis one even better. De skript be clever and fun, all de charakters get enuf screen time, and Cyclops slightly less annoying dis time out. Verdikt: Dis movie be de equivalent of de double-stuffed Oreo platter at Sesame Street’s fanciest French restaurant, La Vieille Chaussette = Exquizit! Rating: 9 out of 10 chocolate chippee cookies.